Published by: Simon & Schuster. Official synopsis: "Nora's never been particularly attracted to the boys at her school. Not until Patch came along. With his easy smile and eyes that seem to see inside her, she is drawn to him against her better judgement. But after a series of terrifying encounters, Nora's not sure who to trust. Patch seems to be everywhere she is and knows more about her than her closest friends.And when she tries to seek some answers, she finds herself near a truth that is way more unsettling than anything Patch makes her feel. For Nora is right in the middle of a centuries-old battle between the immortal and those that have fallen - and sooner or later, she's going to have to pick sides..."
I don't care who you are, but there's just something about that cover. It's intriguing. Eye-catching. And thought provoking. Girls will see a "buff" guy, guys will see someone else for the girls to obsess over. But everyone will see the idea behind the image. A fallen angel. And that is exactly what Patch is. A dark, interesting character. The girls will love him. Guys will want to be him. The ultimate bad boy, that just can't be ressisted. And then there's Nora. She's a bit of a good girl. The complete opposite of Patch. It's this complete and utter difference that makes them contrast well as characters. Becca Fitzpatrick obviously knows how to get characters to interact, because Patch and Nora interact brilliantly, making for hugely entertaining reading. As readers on Twitter will know, I'm struggling to get my true feelings for this book out. It's not the typical book for a guy to read and I have been critisied for reading it (oh isn't that a girls book?! ), but I have to be honest and say that this book blew me away. It's written with amazing skill. It's entertaining. Gripping. I don't care who you are. Male. Female. Alien? This book will amaze. As all true good books do, whoever they are aimed at, they will be appreciated by people of all walks of life. I loved it from start to finish and am fighting not to read the first chapter from the second book, Crescendo, which is at the back of my copy. I don't want to read it and then be itching for months to read the rest of it! Very good. Made me a very happy reader. I really enjoyed this too. I didn't want to put it down and I was reading it when my family were visiting. I am so anti-social when books are this addictive. Great review. BTW, I'm loving the new blog layout. Very sleek. 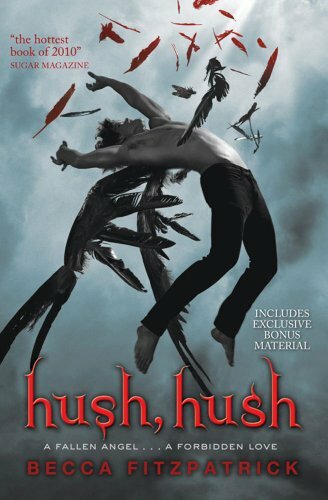 I just read Hush Hush and I found myself wishing it wouldn't end! Unfortunately, I didn't have as much self-control and read the fist of the Crescendo chapter...I really can't wait until that comes out.